If you’re looking for a unique and quirky vacation retreat for your family, we recommend looking up… way up. That’s where you’ll find magic - a place that will transport you back to the wonder of your own childhood. But these treehouses are a far cry from the one that you may have constructed from scrap plywood in your backyard. These feats of engineering are equipped with electricity, indoor plumbing, and much more. So go ahead, release your inner child. When you walk through these doors, we think both you and your kids will squeal with delight. Out ’N’ About Treehouse Treesort is an Ewok-like treetop village tucked into the foothills of the Siskiyou Mountains in southern Oregon. This bed-and-breakfast-style destination is a world away from all the hustle and bustle of life while still offering the creature comforts of home. From the extensive maze of cable bridges connecting treehouses - some more than 30 feet in the air - to the ziplining and horseback riding, there’s something for everyone here. And because the treehouses have been built at various heights, even younger children can be part of the fun. The Treesort is an ideal base for exploring southern Oregon. Known as an adventurer’s paradise, families with older kids can experience epic rafting on the Rogue and Illinois Rivers or mountain biking on some of the Pacific Northwest’s best trails. It’s a visually stunning area yet somehow still undiscovered. 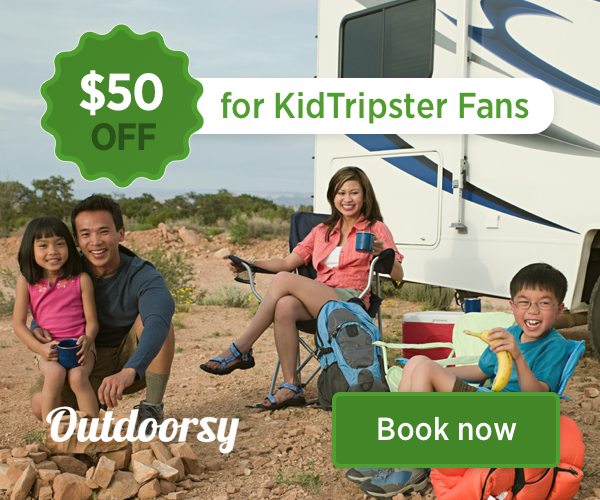 KidTripster Tip: The Treesort doesn’t take online reservations. The owners prefer to have “a more complete and mutually satisfactory interaction” over the phone. It may seem like an inconvenience, but the mandatory human interaction is worth it. Treehouses range in price from $150 to $330/night for two people; extra guests are $25 each/night. Read our full review here. The Carolina Jewel Treehouse is the ultimate treehouse experience. Built in 2016 by The Treehouse Guys from the DIY network (the episode it titled, “Diamond in the Sky”), it’s truly a gem. Appropriately nicknamed the “Tree Castle,” this 2-story hideaway has most of the amenities that you’d expect from a luxury home including a full kitchen, dining area, two full bathrooms (with heated floors! ), and gas fireplace. Inside you’ll find whimsical touches like tree branches that appear to weave in and out of rooms and through the ceiling, and hidden nooks and passageways that kids will love to explore. And don’t miss the lookout tower at the very top of the treehouse. With a queen-sized bed upstairs and a queen-sized sofa bed downstairs, it comfortably sleeps four people. Rates start at $450/night. This treehouse is an ideal base for exploring popular Asheville and the Blue Ridge Mountains. Read our review and suggestions for what to do by clicking here. Plus, we know exactly what little towns you’ll want to explore on this White Mountain getaway. Rates for the smallest treehouse, The Birdie start at $89/night and go up from there. Read our full review here. In Central Texas, the Hill Country surrounding Austin and San Antonio is well known for its refreshing creeks and winding rivers. Quietly nested near the town of Seguin, you’ll find Geronimo Creek Retreat, a wonderfully rustic collection of treehouses, cabins, and tepees. And believe it or not, they all have air conditioning, a must in Texas summers. With complimentary kayaks, paddle boards, inner tubes, and a rope swing, good luck keeping your kids out of the water. Better to join them! Rates start at $117/night. Read our full review here. New Braunfels in Texas Hill Country is a huge draw for families wanting to tube, kayak or canoe on the meandering Guadalupe River. Located just a few steps from the river, the unique treehouse lodgings at Guadalupe River Houses put you in the middle of the action. And with options nearby ranging from the vibrant historic district of Gruene to a 70-acre waterpark to exploring natural underground caverns, this area may just be one of the most remarkable destinations in Texas. Four eclectic treehouses and two bungalow suites surround a large saltwater pool. We recommend the Redwood Tree Haus with it’s own secret passageway to the pool. Rates start at $350/night. Read our full review here. Writers Orion Ludlow, Diana Smith, Sarah Thayer, and Carla Reed contributed to this article. 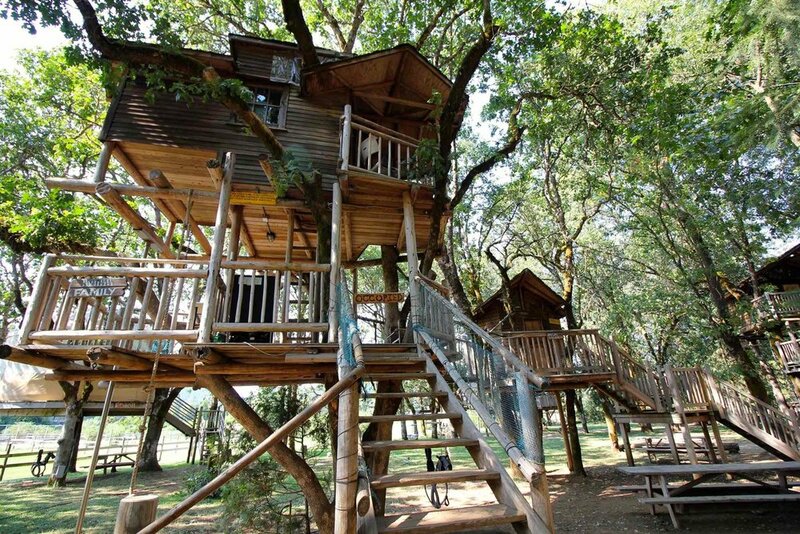 All would admit to feeling like kids again during these treehouse vacations.